Calamari rice, or arroz con calamares, is a good first course or side dish for a dinner. This calamari rice recipe is easy to put together for anyone who enjoys authentic Spanish cuisine and seafood flavors. This Spanish seafood dish also could be served as a main course, especially if you add a few pieces of a solid white fish like halibut or a handful of small clams. You also could serve it with a different type of rice, including a black rice. It's always good to have a versatile recipe on hand and this one is no exception. Rice with squid has a great seafood flavor without the additional work of preparing a paella, and it could be served as a main course of a light dinner. Prepare this recipe and see if it's a new family favorite. Clean the squid thoroughly and cut them into rings. Use the tentacles, but be sure to remove the eye. Peel and finely chop the onion and garlic. Cut the pepper into small pieces. Heat a few tablespoons of olive oil in a heavy-bottomed large frying pan. Sauté the onion and garlic over medium heat. When the onion is golden, add the red pepper and continue to sauté, stirring often, for about 5 minutes. While the onion mixture is sautéing, heat the fish stock in a saucepan, but do not boil the stock. Add the squid pieces to the onion mixture and sauté for three to four minutes. Add the rice to the frying pan and stir to coat rice with oil. Add more oil if needed and “toast” rice for about 2 minutes on medium heat, being careful not to burn it. Pour in fish stock, saffron, and stir. Add salt and pepper to taste. Simmer until the rice is cooked. Add optional peas after rice is cooked. They do add some color and nutritional value to the dish. 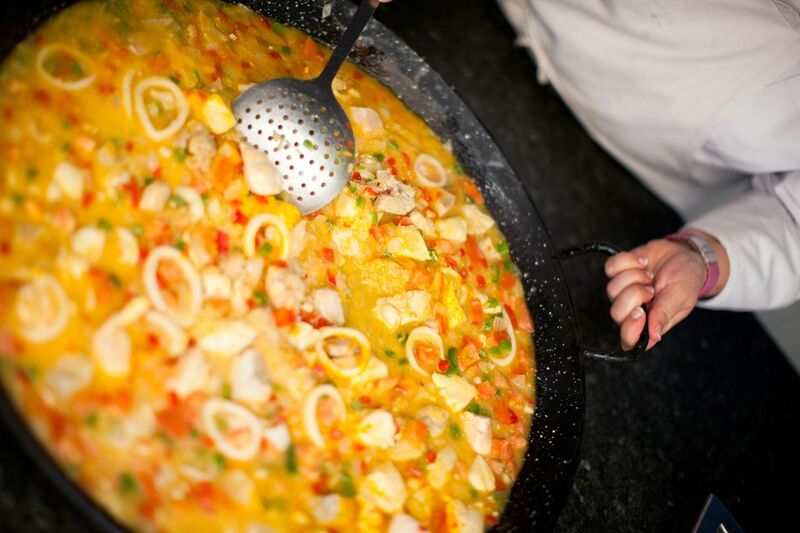 Some Spanish families prefer "soupy" rice and will serve this sort of dish with broth. If you'd like this to be more of a soup than a drier rice dish, add a bit more fish stock to the pan just before the rice is finished cooking. Otherwise, keep it as is, as a less soupy version.